Roosevelt Message To Congress On U.S.
Franklin Delano Roosevelt (January 30, 1882 – April 12, 1945), often referred to by his initials FDR, was the 32nd President of the United States. 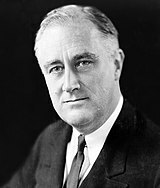 Elected to four terms in office, he served from 1933 to 1945, and is the only U.S. president to have served more than two terms. A central figure of the 20th century, he has consistently been ranked as one of the three greatest U.S. presidents in scholarly surveys. 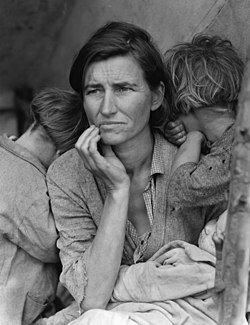 During the Great Depression of the 1930s, Roosevelt created the New Deal to provide relief for the unemployed, recovery of the economy, and reform of the economic system. His most famous legacies include the Social Security system and the regulation of Wall Street. His aggressive use of an active federal government reenergized the Democratic Party. Roosevelt built the New Deal coalition that dominated politics into the 1960s. He and his wife, Eleanor Roosevelt, remain touchstones for modern American liberalism. The conservatives vehemently fought back, but Roosevelt consistently prevailed until he tried to pack the Supreme Court in 1937. Thereafter, the new Conservative coalition successfully ended New Deal expansion, and closed most programs like the WPA and Civilian Conservation Corps, arguing that unemployment had disappeared. After 1938, Roosevelt championed re-armament and led the nation away from isolationism as the world headed into the war. He provided extensive support to Winston Churchill and the British war effort before the attack on Pearl Harbor pulled the U.S. into the fighting. During the war, Roosevelt, working closely with his aide Harry Hopkins, provided decisive leadership against Nazi Germany and made the United States the principal arms supplier and financier of the Allies who defeated Germany, Italy and Japan. Roosevelt led the United States as it became the Arsenal of Democracy and put 16 million American men into uniform. On the homefront his term saw the vast expansion of industry, the achievement of full employment, restoration of prosperity, new taxes that affected all income groups, price controls and rationing, 120,000 Japanese and Japanese Americans sent to relocation camps, and new opportunities opened for African Americans and women. As the Allies neared victory, Roosevelt played a critical role in shaping the post-war world, particularly through the Yalta Conference and the creation of the United Nations. Roosevelt's administration redefined liberalism for subsequent generations and realigned the Democratic Party based on his New Deal coalition of labor unions, farmers, ethnic, religious and racial minorities, intellectuals, the South, big city machines, and the poor and workers on relief. Roosevelt went to Groton School, an Episcopal boarding school in Massachusetts. He was heavily influenced by the headmaster, Endicott Peabody, who preached the duty of Christians to help the less fortunate and urged his students to enter public service. Roosevelt completed his undergraduate studies at Harvard, where he lived in luxurious Adams House and was a member of the Alpha Delta Phi fraternity. While at Harvard, he saw his distant cousin Theodore Roosevelt become president, and Theodore's vigorous leadership style and reforming zeal made him Franklin's role model and hero. 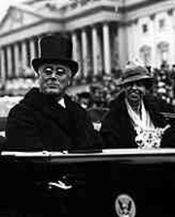 In 1902, he met his future wife Anna Eleanor Roosevelt, Theodore's niece, at a White House reception. (They had previously met as children, but this was their first serious encounter.) Eleanor and Franklin were fifth cousins, once removed. They were both descended from the Dutchman Claes Martensz. van Rosenvelt (Roosevelt) who arrived in New Amsterdam (Manhattan) from the Netherlands in the 1640s. Roosevelt's two grandsons, Johannes and Jacobus, began the Oyster Bay and Hyde Park branches of the Roosevelt family. Eleanor was descended from the Johannes branch, while FDR was descended from the Jacobus branch. In 1910, Roosevelt ran for the New York State Senate from the district around Hyde Park (Dutchess County), which had not elected a Democrat since 1884. He entered the Roosevelt name, with its associated wealth, prestige and influence in the Hudson Valley, and the Democratic landslide that year carried him to the state capital of Albany, New York. Roosevelt entered the state house, January 1, 1911. He became a leader of a group of reformers who opposed Manhattan's Tammany Hall machine which dominated the state Democratic Party. Roosevelt soon became a popular figure among New York Democrats. Reelected for a second term November 5, 1912. He resigned from the New York State Senate on March 17, 1913. Franklin D. Roosevelt was appointed Assistant Secretary of the Navy by Woodrow Wilson in 1913. He served under Secretary of the Navy, Josephus Daniels. In 1914, he was defeated in the Democratic primary for the United States Senate by Tammany Hall-backed James W. Gerard. From 1913 to 1917, Roosevelt worked to expand the Navy and founded the United States Navy Reserve. Wilson sent the Navy and Marines to intervene in Central American and Caribbean countries. In a series of speeches in his 1920 campaign for Vice President, Roosevelt claimed that he, as Assistant Secretary of the Navy, had played a significant role in Latin American politics and had even written the constitution which the U.S. imposed on Haiti in 1915. Roosevelt developed a life-long affection for the Navy. He showed great administrative talent and quickly learned to negotiate with Congressional leaders and other government departments to get budgets approved. He became an enthusiastic advocate of the submarine and also of means to combat the German submarine menace to Allied shipping: he proposed building a mine barrage across the North Sea from Norway to Scotland. In 1918, he visited Britain and France to inspect American naval facilities; during this visit he met Winston Churchill for the first time. With the end of World War I in November 1918, he was in charge of demobilization, although he opposed plans to completely dismantle the Navy. On July 1920, Roosevelt resigned as Assistant Secretary of the Navy. In August 1921, while the Roosevelts were vacationing at Campobello Island, New Brunswick, Roosevelt contracted an illness, at the time believed to be polio, which resulted in Roosevelt's total and permanent paralysis from the waist down. For the rest of his life, Roosevelt refused to accept that he was permanently paralyzed. He tried a wide range of therapies, including hydrotherapy, and, in 1926, he purchased a resort at Warm Springs, Georgia, where he founded a hydrotherapy center for the treatment of polio patients which still operates as the Roosevelt Warm Springs Institute for Rehabilitation. After he became President, he helped to found the National Foundation for Infantile Paralysis (now known as the March of Dimes). His leadership in this organization is one reason he is commemorated on the dime. Roosevelt's "First 100 Days" concentrated on the first part of his strategy: immediate relief. From March 9 to June 16, 1933, he sent Congress a record number of bills, all of which passed easily. To propose programs, Roosevelt relied on leading Senators such as George Norris, Robert F. Wagner and Hugo Black, as well as his own Brain Trust of academic advisers. Like Hoover, he saw the Depression as partly a matter of confidence, caused in part by people no longer spending or investing because they were afraid to do so. He therefore set out to restore confidence through a series of dramatic gestures. The main foreign policy initiative of Roosevelt's first term was the Good Neighbor Policy, which was a re-evaluation of U.S. policy towards Latin America. Since the Monroe Doctrine of 1823, this area had been seen as an American sphere of influence. American forces were withdrawn from Haiti, and new treaties with Cuba and Panama ended their status as United States protectorates. 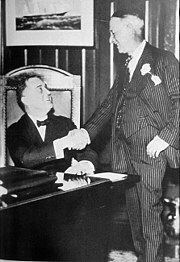 In December 1933, Roosevelt signed the Montevideo Convention on the Rights and Duties of States, renouncing the right to intervene unilaterally in the affairs of Latin American countries. Roosevelt's ebullient public personality helped bolster the nation's confidence. The Supreme Court was the main obstacle to Roosevelt's programs during his first term, overturning many of his programs. In particular in 1935 the Court unanimously ruled that the National Recovery Act (NRA) was an unconstitutional delegation of legislative power to the president. Roosevelt stunned Congress in early 1937 by proposing a law allowing him to appoint five new justices, a "persistent infusion of new blood". This "court packing" plan ran into intense political opposition from his own party, led by Vice President Garner, since it seemed to upset the separation of powers and give the President control over the Court. Roosevelt's proposals were defeated. The Court also drew back from confrontation with the administration by finding the Labor Relations Act and the Social Security Act to be constitutional. Deaths and retirements on the Supreme Court soon allowed Roosevelt to make his own appointments to the bench with little controversy. Between 1937 and 1941, he appointed eight liberal justices to the court. Roosevelt used his personal charisma to build support for intervention. America should be the "Arsenal of Democracy," he told his fireside audience. In August, Roosevelt openly defied the Neutrality Acts by passing the the Destroyers for Bases Agreement, which gave 50 American destroyers to Britain in exchange for base rights in the British Caribbean islands. This was a precursor of the March 1941 Lend-Lease agreement which began to direct massive military and economic aid to Britain, the Republic of China and the Soviet Union. Thus, by mid-1941, Roosevelt had committed the U.S. to the Allied side with a policy of "all aid short of war." Roosevelt met with Churchill on August 14, 1941, to develop the Atlantic Charter in what was to be the first of several wartime conferences. In July 1941, Roosevelt ordered Secretary of War Henry Stimson to begin planning for total American military involvement. The resulting "Victory Program," under the direction of Albert Wedemeyer, provided the President with the estimates necessary for the total mobilization of manpower, industry, and logistics to defeat the "potential enemies" of the United States. The program also planned to dramatically increase aid to the Allied nations and to have ten million men in arms, half of whom would be ready for deployment abroad in 1943. Roosevelt was firmly committed to the Allied cause and these plans had been formulated before the Japanese attacked Pearl Harbor. On December 7, 1941, the Japanese attacked the U.S. fleet at Pearl Harbor, destroying or damaging most of it and killing more than 2,400 American military personnel and civilians. The Japanese took advantage of their preemptive destruction of most of the Pacific Fleet to rapidly occupy the Philippines and the British and Dutch colonies in Southeast Asia, taking Singapore in February 1942 and advancing through Burma to the borders of British India by May, cutting off the overland supply route to the Republic of China. Antiwar sentiment in the United States evaporated overnight and the country united behind Roosevelt. Despite the wave of anger that swept across the U.S. in the wake of Pearl Harbor, Roosevelt decided from the start that the defeat of Nazi Germany had to take priority. On December 11, 1941, Germany and Italy declared war on the United States. Roosevelt met with Churchill in late December and planned a broad informal alliance between the U.S., Britain, China and the Soviet Union, with the objectives of halting the German advances in the Soviet Union and in North Africa; launching an invasion of western Europe with the aim of crushing Nazi Germany between two fronts; and saving China and defeating Japan. The "Big Three" (Roosevelt, Churchill, and Joseph Stalin), together with Chiang Kai-shek and Charles de Gaulle, oversaw an alliance in which British, American and French troops concentrated in the West, Russian troops fought on the Eastern front, and Chinese, British and American troops fought in the Pacific. The Allies formulated strategy in a series of high profile conferences as well as contact through diplomatic and military channels. Roosevelt guaranteed that the U.S. would be the "Arsenal of Democracy" by shipping $50 billion of Lend Lease supplies, primarily to Britain and also to the USSR, China and other Allies. The Allies undertook the invasions of French Morocco and Algeria (Operation Torch) in November 1942, of Sicily (Operation Husky) in July 1943, and of Italy (Operation Avalanche) in September 1943. The strategic bombing campaign was escalated in 1944, pulverizing all major German cities and cutting off oil supplies. It was a 50-50 British-American operation. Roosevelt picked Dwight D. Eisenhower, and not George Marshall, to head the Allied cross-channel invasion, Operation Overlord that began on D-Day, June 6, 1944. Some of the most costly battle of the war insued after the invasion, and the Allies were blocked on the German border in the "Battle of the Bulge" in December 1944; when Roosevelt died Allied forces were closing in on Berlin. By late 1943, it was apparent that the Allies would ultimately defeat Nazi Germany, and it became increasingly important to make high-level political decisions about the course of the war and the postwar future of Europe. 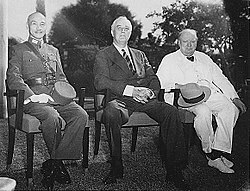 Roosevelt met with Churchill and the Chinese leader Chiang Kai-shek at the Cairo Conference in November 1943, and then went to Tehran to confer with Churchill and Stalin. At the Tehran Conference, Roosevelt and Churchill told Stalin about the plan to invade France in 1944, and Roosevelt also discussed his plans for a postwar international organization. For his part, Stalin insisted on the redrawing the frontiers of Poland. Stalin supported Roosevelt's plan for the United Nations and promised to enter the war against Japan 90 days after Germany was defeated. By the beginning of 1945, however, with the Allied armies advancing into Germany and the Soviets in control of Poland, the issues had to come out into the open. In February, Roosevelt, despite his steadily deteriorating health, traveled to Yalta, in the Soviet Crimea, to meet again with Stalin and Churchill. After the war Polish Americans criticized the Yalta Conference for legitimizing Soviet control of Eastern Europe. However, Roosevelt had already lost control of the situation, and put all his hopes on postwar deals with Stalin. 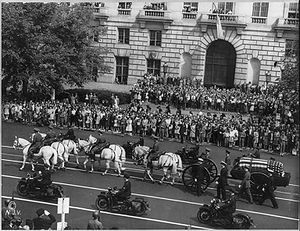 Roosevelt, only 62 in 1944, was in declining health since at least 1940. The strain of his paralysis and the physical exertion needed to compensate for it for over 20 years had taken their toll, as had many years of stress and a lifetime of chain-smoking. He had high blood pressure and long-term heart disease. Aware of the risk that Roosevelt would die during his fourth term, the party regulars insisted that Henry A. Wallace, who was seen as too pro-Soviet, be dropped as Vice President. After considering James F. Byrnes of South Carolina, Roosevelt replaced Wallace with the little known Senator Harry S. Truman. In the 1944 election, Roosevelt and Truman won 53% of the vote and carried 36 states, against New York Governor Thomas Dewey. When he addressed Congress on his return from Yalta, many were shocked to see how old, thin and sick he looked. He spoke while seated in the well of the House, an unprecedented concession to his physical incapacity. But mentally he was still in full command. "The Crimean Conference," he said firmly, "ought to spell the end of a system of unilateral action, the exclusive alliances, the spheres of influence, the balances of power, and all the other expedients that have been tried for centuries — and have always failed. We propose to substitute for all these, a universal organization in which all peace-loving nations will finally have a chance to join." Roosevelt's record on civil rights has been the subject of much controversy. He was a hero to large minority groups, especially African-Americans, Catholics and Jews. African-Americans and Native Americans fared well in the New Deal relief programs, although they were not allowed to hold significant leadership roles in the WPA and CCC. Roosevelt needed the support of Southern Democrats for his New Deal programs, and therefore decided not to push for anti-lynching legislation that might threaten his ability to pass his highest priority programs. Roosevelt was highly successful in attracting large majorities of African-Americans, Jews and Catholics into his New Deal Coalition. Beginning in 1941 Roosevelt issued a series of executive orders designed to guarantee racial, religious and ethnic minorities a fair share of the new wartime jobs. He pushed for admission of African-Americans into better positions in the military. In 1942 Roosevelt made the final decision in ordering the internment of Japanese Americans and other ethnic groups during World War II. Beginning in the 1960s he was charged with not acting decisively enough to prevent or stop the Holocaust which killed 6 million Jews. Critics cite episodes such as when in 1939, the 950 Jewish refugees on board the SS St. Louis were denied asylum and not allowed into the United States. A 1999 survey of academic historians by CSPAN found that historians consider Abraham Lincoln, George Washington, and Roosevelt the three greatest presidents by a wide margin, and other surveys are consistent. Roosevelt is the sixth most admired person from the 20th century by US citizens, according to Gallup. Roosevelt's home in Hyde Park is now a National historic site and home to his Presidential library. His retreat at Warm Springs, Georgia is a museum operated by the state of Georgia. The Roosevelt memorial has been established in Washington, D.C. next to the Jefferson Memorial on the Tidal Basin, and his image appears on the Roosevelt dime. Many parks, schools, roads, an aircraft carrier and a Paris Metro station have been named in his honor, as well as smaller places such as a high school in Puerto Cortés, Honduras. Twelve days after his death in 1945, Thomas Jefferson College in Chicago was renamed after FDR with Eleanor's blessing. ^ Arthur Schlesinger, The Crisis of the Old Order, 364, citing to 1920 Roosevelt Papers for speeches in Spokane, San Francisco, and Centralia. The role Roosevelt actually played in the development of Haiti's constitution has been disputed, but the remark was at best a politically awkward overstatement and caused some controversy in the campaign. ^ See the text of the address at Wikisource..
^ Darby, Michael R.Three and a half million U.S. Employees have been mislaid: or, an Explanation of Unemployment, 1934-1941. Journal of Political Economy 84, no. 1 (1976): 1-16. ^ Historical Statistics (1976) series Y457, Y493, F32. The increase in debt during the depression and World War II are shown on the chart below. ^ Smiley, Gene, "Recent Unemployment Rate Estimates for the 1920s and 1930s," Journal of Economic History, June 1983, 43, 487-93. ^ Presidents and job growth. The New York Times. Retrieved on 2006-05-20. ^ United States Internal Revenue Code, 26 USC ɠ 1, Legislative History. ^ Derby counts WPA workers as employed; Lebergott as unemployed source: Historical Statistics US (1976) series D-86; Smiley 1983 Smiley, Gene, "Recent Unemployment Rate Estimates for the 1920s and 1930s," Journal of Economic History, June 1983, 43, 487-93. ^ Leuchtenberg (1963) pp 199-203. ^ Leuchtenberg (1963) pp 203-210. ^ Leuchtenberg (1963) pp 183-196. ^ Leuchtenberg (1963) pp 239-43. ^ Leuchtenberg (1963) ch 11. ^ See Quarantine speech on wikisource. ^ The Victory Program, Mark Skinner Watson (1950), 331-366. ^ Franklin D. Roosevelt and American Foreign Policy, 1932-1945, Robert Dallek (1995) at 520. ^ War in Italy 1943-1945, Richard Lamb (1996) at 287. The Washington Post found Washington, Lincoln, and Roosevelt to be the only "great" presidents. Lash, Joseph P. Eleanor and Franklin: The Story of Their Relationship Based on Eleanor Roosevelt's Private Papers (1971), history of a marriage. Beschloss, Michael R. The Conquerors: Roosevelt, Truman and the Destruction of Hitler's Germany, 1941-1945 (2002).